The purpose of this article is to answer the question: "Where can I get the best salads In Kyoto, Japan?" By reading this quick article, I hope you have the opportunity to visit at least one of the places that I recommend. After settling into life in Kyoto and trying all the delectable traditional dishes, I began to crave the kind of salads that I could easily obtain anywhere in San Francisco. As such, I began a serious hunt for the most affordable, high quality, and delicious salads that I could find near my area. With a strong determination to find the best restaurants that served scrumptious salads, I went to many restaurants with my wonderful friend Doina, who had a similar desire. Through her, I was introduced to a few phenomenal places. Enjoy this list of the top 3 salads in Kyoto with a few runner ups! Starting from the least expensive salad, I present the following list below. I hope it serves you well. 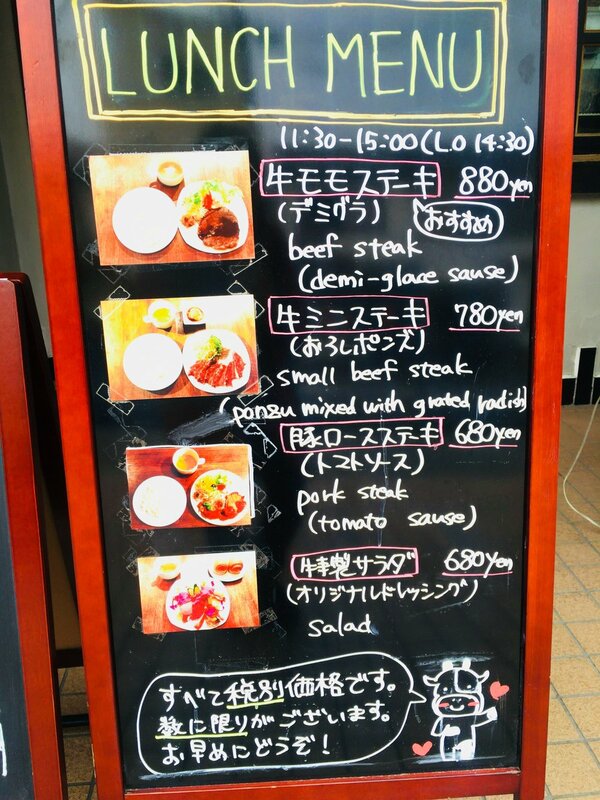 A delectable salad with deli meats, eggs, a side of soup, and 2 bread rolls for only ¥680, or ¥730 with tax. A quaint restaurant with a homey feel, this place is perfect for those who can speak a little bit of Japanese, and would like to converse with an extremely warm, elderly Japanese woman. Normally, Japanese people never hug you, as touching or hugging is considered to be an invasion of one’s personal space. Growing up with a Japanese mother, I know that it’s difficult for her to accept or give hugs, as it was not part of her culture growing up. In fact, it makes her slightly uncomfortable to be hugged, as she’s not used to it. And the same thing is true for my Japanese relatives. On the flip side, the first thing I do when I greet my American family members is — give them a reciprocal hug! So you can imagine my surprise, when this elderly Japanese woman gave me such a warm, generous, and uninhibited hug! In fact, it was one of the best hugs I have ever received. Believe me, when I say she’s got a lot of love for newcomers. 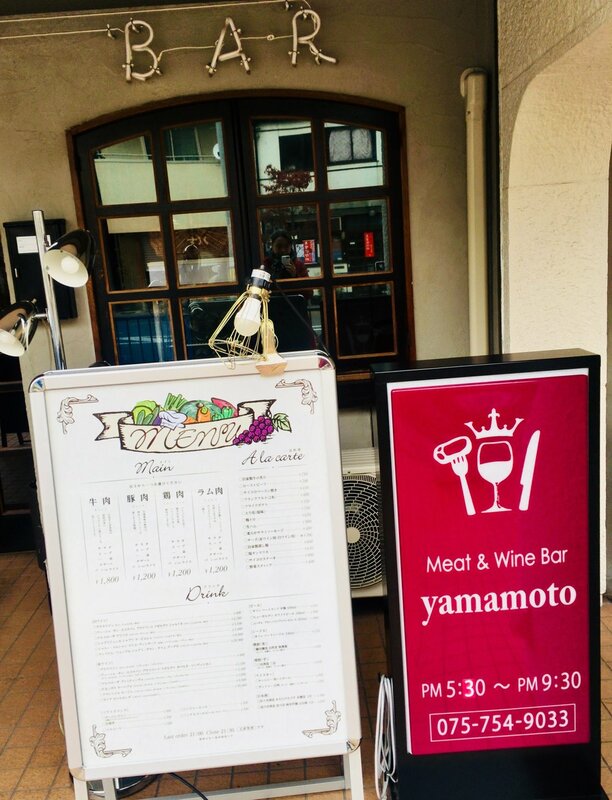 While she doesn’t speak English, this bar offers the most reasonably priced salad that I have found thus far in Kyoto with true diversity in the types of vegetables and proteins that it uses. Unlike the chain restaurant Saizeriya that serves tiny salads with up to 3 types of vegetables, this salad offers a healthy mix of fresh vegetables and protein. And while I haven’t personally been to this bar for dinner, I’m sure it's equally impressive. Plus, they sometimes host events in the evenings. Stop by and ask for further details, if you are interested in attending an event. Strengths: Inexpensive. High-quality and scrumptious salad. Amazing elderly waitress. And great service! Weaknesses: Dark interior. No English speakers. And the bread roll is soft, so it’s not my personal favorite. Note: Unfortunately, it’s not listed on Google Maps, so I had to provide a link to the general area. But I’m sure you will have no trouble finding it with the helpful pictures. Basically, a simple ham and avocado salad for ¥890 + Tax. For an additional ¥200, you can get a side of garlic bread. While the service is mediocre, this place is definitely worth a visit, if you are craving a very unique experience. Adorned in American-style knickknacks, this place is decked from floor to ceiling with captivating decor. For example, every inch of the wall is covered in popular American symbols such as miniature Homer Simpsons. Definitely the owner got some inspiration from California and Hawaii, as it exudes a surfer vibe. Not only do they serve scrumptious, well-portioned salads, but they also serve a diverse array of foods ranging from Western-style, extremely sweet pancake creations and hamburgers, to Japanese / Hawaiian-style taco rice dishes. 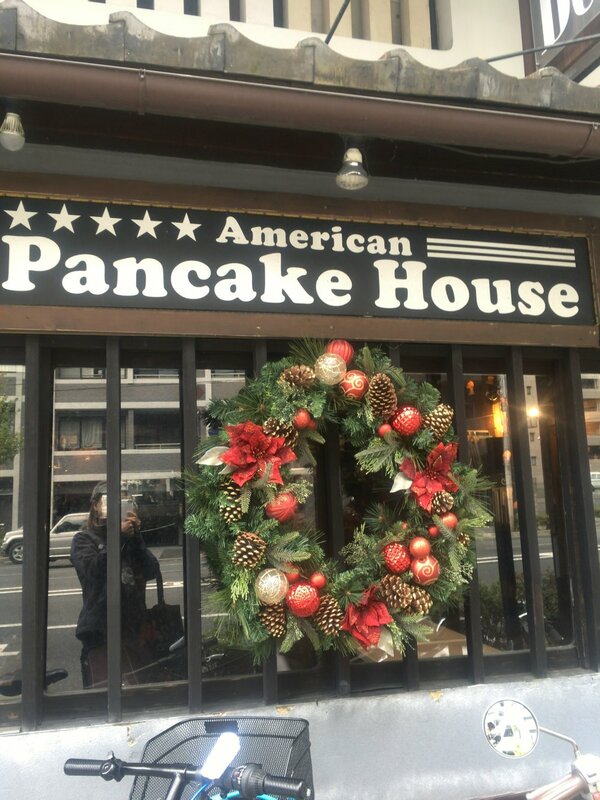 Offering American-sized portions for a reasonable price and entertaining decor, this place still remains as one of my top 3 in Kyoto, even with its shortcomings. Strengths: Large portion sizes. Absolutely captivating decor. And they have an English menu. Weaknesses: Poor service (understaffed & large space). An organic salad with bacon, eggs, anchovy with mayonnaise sauce, organic Soup, and a slice of bread for ¥1,350. For an extra ¥300, you can choose a drink from a set menu. While there are many scrumptious meals on this menu, I have only tried the B Set. It was a match made in heaven, and I instantly fell in love. In fact, it was so good that it made me want to come back every day. The café sits underneath a gallery, in a bright, open space with an open kitchen. The staff members are kind, and often converse with a few regular guests. Before a hike one time, I decided to try one of their daily scone offerings. And since I hiked all day, it turned out to be an excellent treat. But had I not gone hiking, I don’t think I would have enjoyed it as much. After all, everything tastes better after intense exercise. Regardless, the salads are absolutely phenomenal, as they use fresh, high-quality ingredients that literally melt in your mouth. Seriously, you should try it! Pro Tip: If you want to reduce the overall price and don’t feel like drinking soup, then you will be able to save approximately ¥300. Strengths: Amazing high-quality food. Modern and stylish decor. Good service. And an English menu. Weaknesses: Staff may rush you if you are there past 18:45, as the store closes promptly at 19:00. A fantastic gluten-free cafe with many vegan and vegetarian salads, but it comes with a hefty price tag of ¥1,400. A well-designed cafe and bakery with a fantastic mix of Japanese and foreign customers. However, I ordered the exact same French Niçoise Salad on 2 different occasions & received 2 different results. Finally, I wanted to conclude this article with a slideshow of the amazing salads that I ate during my 2017 trip to startups in Silicon Valley. Want some inspiration? Learn more about these inspiring women entrepreneurs!